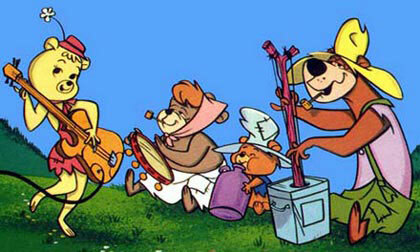 The Hillbilly Bears is an animated television series produced by Hanna-Barbera Productions. It aired as a segment on The Atom Ant/Secret Squirrel Show for two seasons, from 1965 to 1967. During the first half of the 1966-67 television season, The Atom Ant/Secret Squirrel Show was split into two shows, and The Hillbilly Bears aired as part of The Atom Ant Show. 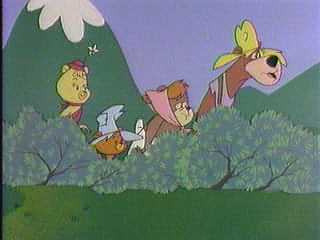 The characters in the series were a family of four anthropomorphic bears: Paw and Maw Rugg, their teenage daughter Floral, and their young son Shag (whose voices and personas were nearly identical to Elroy and Judy Jetson). The Hillbilly Bears played on a social stereotype of the "hillbilly", with a gun toting, mumbling father (Paw Rugg) who was always "feudin" with the neighbors the Hoppers. Paw Rugg's voice was a comical mumble, splattered with a few understandable words. Particularly in the first episodes, Paw Rugg's voice was incomprehensible; his speech improved with the later episodes. "Feudin" was usually a lethargic operation in which the protagonists fired the same bullet back and forth from the comfort of their rocking chairs.